Despite the stunning views offered by boat of Michigan’s Pictured Rocks National Lakeshore, one of the very best ways to experience this geological haven is on foot. 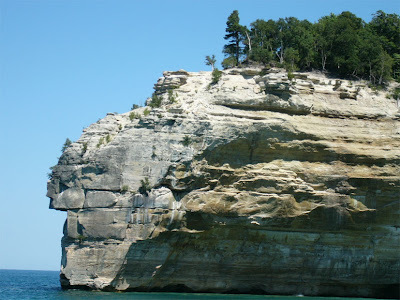 Make time for the Pictured Rocks Boat Cruise before leaving, though; it delivers splendid views of the fascinating cliffs and their brilliant colors caused by groundwater seeping out through the sandstone cliff faces and leaving mineral-stained streaks behind. In fact, the only way to see the most colorful of these formations is from the water, so the 3-hour roundtrip voyage is worth the ticket price and somewhat hokey historical commentary. In some spots, the colors are so vivid they seem manmade, as if someone hovered above the lake with a paintbrush and hundreds of cans of blue, green, red, purple, and orange paint. 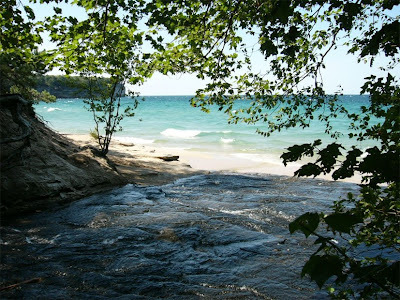 For those who want a closer look at this stretch of Lake Superior and its captivating cliffs, hiking trails run along the entire stretch of the National Lakeshore with several loops leading to waterfalls, rock formations, inland lakes, campgrounds, and beaches. Some trails are short and will satisfy an urge for a quick fix of the area’s natural beauty; others will range from a few hours worth of walking to all-day excursions. At just under 10 miles, the Chapel Loop Hiking Trail offers relatively easy terrain and spectacular views that can be appreciated by even the most seasoned hiker. Noteworthy rock formations, such as the arches Lovers Leap and Grand Portal, are seen from the trail and others can be explored up close as this hike leads directly onto the tops of some impressive cliffs. For those who aren’t afraid of a hearty day hike, an additional 3-mile (roundtrip) offshoot leads to Spray Falls: a 70-foot waterfall that tumbles off a cliff directly into Lake Superior. Starting from the trailhead at the end of Chapel Rd. and heading west past Mosquito Falls – a series of 3 small waterfalls flowing along a short stretch of Mosquito River – the path eventually connects with the North Country Trail at Mosquito Beach. This rocky stretch of Lake Superior shore offers up-close views of colorful layers of attractively formed sandstone. Despite the dubious name, there tend to be very few mosquitoes along this trail segment due to the close proximity of Lake Superior and the cool air almost continually blowing inland. Now it’s time to head northeast along Lake Superior. Here, Chapel Loop follows the North Country Trail: a National Scenic Trail that cuts a continuous path through North Dakota, Minnesota, Wisconsin, Michigan, Ohio, Pennsylvania, and New York. Along this section of lakeshore the trail weaves in and out of a forest thick with white birch, maple, beech, and hemlock trees, and out onto the tops of cliffs 100-200 feet above the very blue and very cold Lake Superior. One of the many hiking highlights is the cliff formation called “Indian Head”, so named due to its unmistakable resemblance to a Native American male’s profile. One of the most impressive cliff formations along the entire stretch of lakeshore, glimpses of Indian Head are spotted from the trail for a mile or so leading up to the massive rocky protrusion. 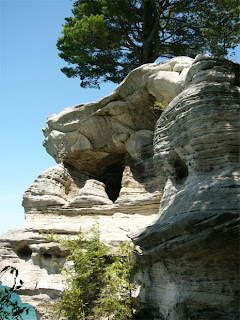 Abruptly, the trail leaves the woods and leads out to the top of the cliff where various shapes have been carved into the sandstone surface due to ancient glacial activity and continuous erosion from waves and ice. It is easy to lose track of time here marveling at the geology and taking in the spectacular view of the largest and deepest of the Great Lakes. Grand Island can be seen in the distance near the town of Munising, and huge boulders at the bottom of the lake are plainly visible through the crystal clear turquoise water below. 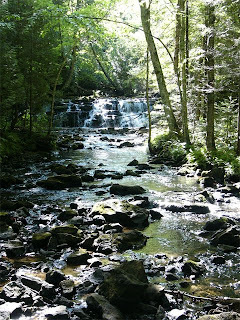 Chapel Creek flows out of the forest and cascades over sand and stone to empty with quiet subtlety into Lake Superior at Chapel Beach. A wooden footbridge crosses the stream just before it exits the forest and is an excellent spot to take a break and eat lunch, or simply rest and enjoy the serenity of a perfect natural setting. Here, another of the more captivating rock formations marks the spot where Chapel Loop parts from the North Country Trail and turns inland to return to the trailhead. From this point, one can choose to continue along the lakeshore and the North Country Trail to Spray Falls or start the journey back. Before this, however, it is necessary to check out Chapel Rock. Located at the eastern end of Chapel Beach, Chapel Rock is a tall, layered sandstone formation worn through with holes and sporting a single tree standing straight up from its flat top. It doesn’t seem possible that a tree could grow out of this rock, and on closer inspection, its long roots can be seen extending from the base of the trunk, through the air and into the adjacent woods where they burrow into the ground. In the past a rock archway supported these roots and connected the formation to the mainland, but it eventually eroded away and now they are left suspended in midair tethering the tree to the nearby earth. 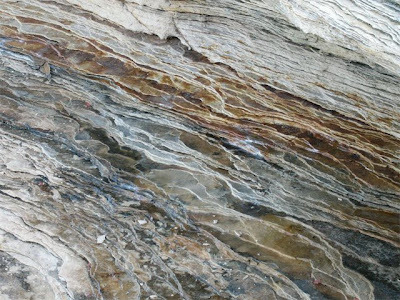 The rock itself is fascinating with its many layers and intriguing shape. As fantastic as it is to think that it was created by erosion, it is also sad to think that the same erosion continues today and will eventually destroy this incredible landmark altogether. 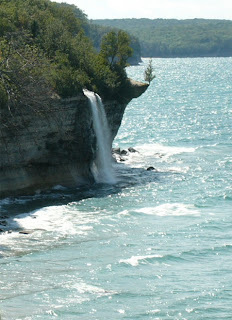 Instead of embarking on the return journey just yet, continue on the North Country Trail a bit further to Spray Falls. It is necessary to hike just past the waterfall and onto an exposed cliff, which is perfectly placed to take in the view of the 70-foot plunge. Invisible from the surface, the remains of Superior, a shipwreck dating back to 1856, lie in the depths below. The return route past Chapel Rock and back along the final section of Chapel Loop offers views from a couple of different vantage points of Chapel Falls: a beautiful 60-foot waterfall that cascades down the face of a cliff in an upside-down V shape into a wooded gorge below. 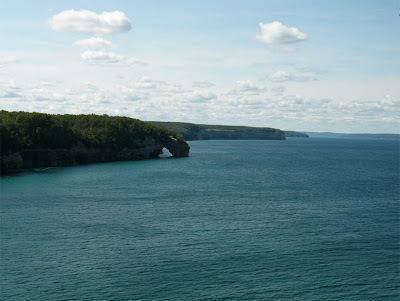 This hike is an ideal way to spend a day in Pictured Rocks National Lakeshore. Be prepared for it to take 6-8 hours depending on how much exploring and picture-taking you might want to do. Bring plenty of water, as well as a jacket or fleece. Even in summer it can get chilly out on the exposed cliffs above Lake Superior, so you’ll want to have an extra layer just in case. At the end of this perfect day, drive to Munising for a pasty at Muldoon’s, or just collapse onto your sleeping bag. The rest has been well-earned! WOW! Those views are spectacular! 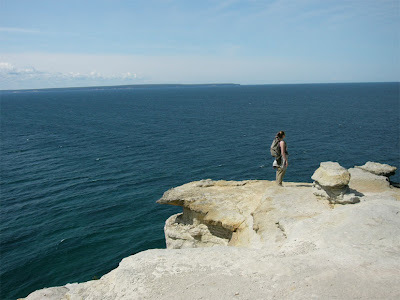 We're introducing our 6 year old niece to backpacking soon, with a visit to this part of Pictured Rocks National Lakeshore. Thanks for the preview! Awesome! I'm hoping to get a chance to visit this area again this fall. It's one of my very favorite spots, and I haven't been there in a long time. Have a great time and let me know how it goes!